Killing Hadden causes a serious faction hit. I killed him 2x's second time got my earring. Any time i'm in the zone and hes up I always kill him just incase he has the earring on him I probably have killed him about 10 times in the past year on and off, was in the zone with my level 49 rogue and saw that he was up so I killed him and he had it :). I have camped this guy many times, killing Rephas and Axe alot of times to get him to spawn. In the times he actually did spawn ,no earring. Do not waste your time killing Axe and Rephas they have absolutely nothing to do with hadden's spawn. Hadden spawns every 5 and a half hours give or take a few minutes. All killing the others on the pond will do is occupy your time. Oh and Rephas drops bait if you run out and don't want to lose the camp. I have killed Hadden over 60 times and loot 25 earrings. I do know this spawn. OBTW around kill number 50 the faction hit finally added up to the point most merchants in Qeynos would not speak to me. 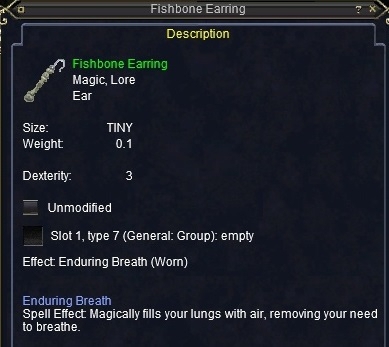 Okay I killed Hadden at 3:30 in the morning last night with my buddy, and sure enough... he dropped the "elusive" Fishbone Earring. I had to kill him 4 times before i could get the earring! I hope the merchants in Qeynos still sell to me, and I hope the guards don't attack me when I try and go into qeynos lol. Someone mentioned that axe broadsmith doesn't get involved... LIES!!! I camped hadden for almost five hours, then he spawned, I killed him with the help of a high level druid that must have had him timed because she showed up less than a minute after he spawned... she asked if i was there for hadden i said yes, she asked if i needed help, i said yes. I hit him with a dot and his buddies Axe broadsmith, and the other relphas and his pet, or something like that came to his aide. Good thing she stayed to help me! We killed him, no earring! blah! You neglected to mention your race and class. You may be experiencing race/class hate from the others. I tried approaching Rephas with a Shadowknight once, big mistake. Necro/SK is apparently bad mojo with Rephas and may be with other NPC's around the zone as well. May update what I learn if I do farm there. be aware now since peeps sell plat on line prices are inflated in the hopes youll respend the plat on an over priced item. Has anyone else noticed that the price for these in the Bazaar has jumped dramatically since GoD came out? They used to sell for 300pp to 500pp and now the cheapest they are selling for is 5k. This seems a bit outrageous... just exactly how many tribute points do you get for them? The reason is because GoD introduced a spot where you could fish for 2000+ plat an hour, with no danger. They nerfed it about a month and a half after release, but the damage was done. The price of the items received through fishing ( 1 - 15lb. fish) was ~11 plat per. Fish a few stacks, and, well.. It adds up. Got up one day and the wife is playing yer young ranger alt and tells me that Hadden is up but noone in the zone is old enough to kill him. He had been up for a while and she even sent a tell to a 50+ druid that was in the zone eventually and druid had no interest in it. So I logged on, jumped down to North Qeynos and ran there and killed him. He dropped the earring. also you have to waste the whole 5 hours waiting becasue if you show up only an hour early he will be camped already.. lots of people know when he died last.. set their timers... log out on top of him.. and log in every 5 hours to see if he is camped. I was heading to WK to farm the Ogres abit.. and decided what the hell.. Ran over to see if Hadden was up and for once not camped... and he was! This was my first time killing him and it was very easy.. root.. send it pet.. dot dot.. nuke...sit.. watch the show.. and I got the fishbone earring! Not bad for a first try.. no waiting and the prized drop! I killed Hadden last night. Solo'd him as a 42nd level necromancer. I sat across the lake from the shed with my pet parked in the water between me and the shed. He popped right outside of the fishing shed, on the edge of the water. I pulled him with a DoT and had my pet engage him in the lake itself. He never left the water. When he died, no earring. So, put the rumor to rest that engaging Hadden in the water will guarantee an earring. Further details: In the Shed was a con green guy named "Broadaxe", north of the shed on the same side was con light blue "Rephas" and "Rephas pet". To the south, on my side, was a Qeynos Guard. At the very south tip of the lake was "Erudite Traveler" and "Erudite Traveler pet". Absolutely nobody came to Hadden's aid. Is this guy really exist? I never see this at all. can anyone tell me the loc of him? I've managed to pop in on Hadden four times now, at random times. Easy kill, just rooted and DoT'd, watched him die, no one assisted him. He dropped the earring on the first and fourth kills. I rooted him where he stood, so he was not in the water. Very much a random drop, but I feel good about my 50% success rate..........so far. guess I could have a string of no-drops that would ruin that. Once again, rooted and killed where he was standing. What negative faction hits to you get camping this guy, ?? Is it first time you are KOS or you can camp him awhile? just wanted to post since all of the patches.. and all sorts of stuff has been changing in the game. "Death to all who oppose me!" "Illusion is but a veil on the mind"
Ok, so I was slapping Chief Goonda around with my 51 bard in WK and get bored and decide to go to QH to see if perchance Hadden is up. To my amazement he was, and to my further amazement, nobody was camping him. Pulled him south through the water, killed him, looted the fishing pole and (WOOT!) the Fishbone Earring. I took note of the time, passed the FB Earring to my 34 warrior. I come back 5 hours later, nobody is camping him, so I wait. He pops again approximately 5 hrs 20 minutes after the first kill, he has the fishing pole on him. I repeat the process, pulling him south through the water, kill him, bend down to loot and... this is where it gets weird, as soon as I right click his corpse to loot, his fishing pole vanishes from his corpse. The only thing he had on him was some change and words of uselessness. I'm not sure, but I thought I detected a flash in the loot window as it appeared also. I still had the fishing pole on me from the last time, I don't know if that had any effect, or maybe Verant figured out a way to list the people who have looted him and nerf the loot to them. When he has the fishing pole, he usually drops the fishing pole, but this is the first time I have ever seen visible in-hand loot vanish off a corpse as I attempted to loot it. I wish I'd burned that fishing pole, or maybe I should try it with another toon. If I find out anymore, I'll let you know. What happened was, the fishing pole is probably a lore item. If you attempt to loot a lore item that you already have, even if it is in the bank and not on you, it will disappear and you will see a message sayiong that you already have one of this item. That's my guess as to what happened. just killed him, no loot whatsoever. Bah! Rephas helped him and charmed me for a while! Had to root rephas and train hadden out into the hills where i could take him out safely. Just a note, he doesnt have a big faction hit. I am STILL ally to guards, merchants, antonius bayle.